Beer Passport and our Proust Questionnaire! 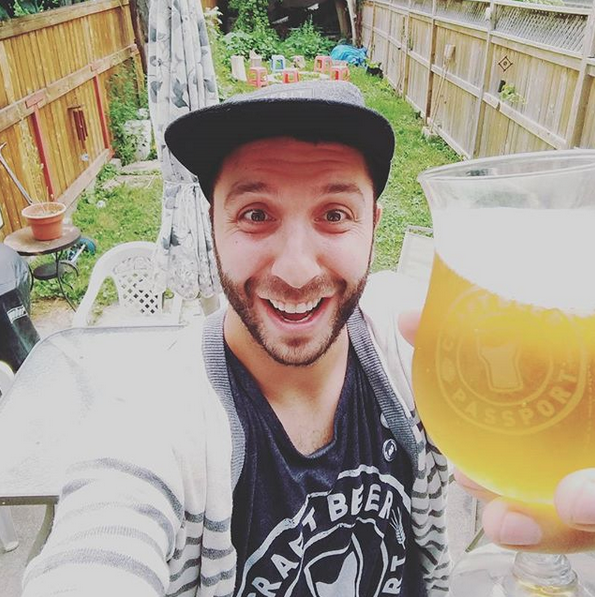 Mike Stulberg is the Toronto-based founder of Craft Beer Passport, the program that recently expanded to Ottawa, including Flora Hall Brewing. See more about the program click here. To get to know Mike a bit better, we invited him to answer our Proust Beer Questionnaire, and here are his answers . . .
1. The first beer I ever drank was . . . a Lakeport Honey from my best friend’s dad’s basement fridge. We would wait until he went to sleep, then sneak downstairs and share a bottle. Half a bottle of that stuff was about all I could drink at the time and more than I’d want to drink now! 2. The last beer I drank was . . . Be Good by Fairweather Brewing Co. in Hamilton. It’s a dry-hopped saison. Very dry and sessionable with great stone fruit aromas. Highly recommend that brewery. 3. The best beer I’ve ever had was … the one I drank last. For me beer is contextual. I can really enjoy a beer one day in a certain context and then feel it to be lacking at a different time and place, with different people, different food or a different mood. I try to choose beer that fits the context. I recently shared a bottle of Rage & Love (a fruited sour with plum and cardamom) by Rainhard Brewing with a friend over an Indian thali in the park for lunch. So good! 4. My fondest memory that includes beer was . . . travelling in Guatemala last winter and I took out a canoe on Lake Atitlan with a friend. We were passing a small Mayan village when a group of guys hanging out by the rocks called us over to shore. They lifted a six pack of beer into the air and with big smiles yelled, “Quieres cerveza?” It wasn’t every day they saw foreigners casually paddling by their village, so they were curious about us. We went over and with broken Spanish and English and plenty of beers, we managed to all hang out, chat, swim and get to know each other for the rest of the afternoon. It was never plainer to me how beer can bring people together. 5. My perfect place to drink a beer is . . . at a local brewery, or outside with friends or a good book. 6. If I could invite three people from history over for a beer they would be . . . Shakespeare for his sense of humour, Marco Polo for his travel stories and Nietzsche for his wisdom, angst and passion! 7. A food that should never be eaten without beer is . . . a hamburger. It’s just not okay to do. 8. That time when I was drinking beer and it didn’t go so well was . . . when I was young and just started drinking beer and discovered I was allergic to it. My face would get blotchy, actually splotchy. It sucked for a few months but I kept with it and eventually the allergy went away. Thank God it did. 9. A style of beer that I do not like is . . . the milkshake IPA. I know it’s on trend right now and I’ve really tried to like it, but it’s just not what I’m looking for in an IPA. To me, the unique “sweet” flavours and aromas produced by different varieties of hops, enjoyed in harmony with the malts, are kind of muted by the addition of lactose sugar. I like my IPAs to burst with fresh hop flavours, evoking the sweetness of peach, pineapple or tangerine, rather than produced by the addition of straight-up sugar. Also, a bit of bitterness keeps me curious, reaching for more. 10. If I were a beer, I would be . . . This is a question my therapist should ask me. Is there a market for beer therapy? Probably. So I’d love to say something exotic like a Flanders Red or Gueuze or something interesting like that, but I think I would be a good old Session IPA. I’m flexible, open minded and fairly outgoing, but not there to hang you up. I’m not necessarily for everyone all of the time, but people can usually find something to like.